Does anyone have a horse I can borrow? I want to ride one through the streets of the Central West End and holler at people. Magnus is coming! Magnus is coming! I hate secrets. I’m terrible at keeping them. Call me a journalist: The truth will set you free. 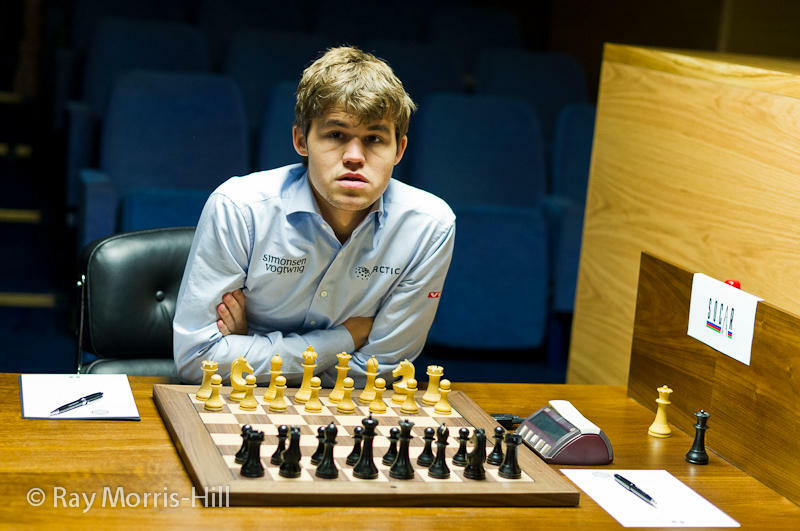 Magnus Carlsen is 22 and the world’s highest-rated player ever. He will be in St. Louis for a tournament in September. And now I can reveal that Magnus Carlsen (top world player), Levon Aronian (number two in the world), Hikaru Nakamura and Gata Kamsky (one and two in the U.S. will meet Sept. 9-15 at the Chess Club and Scholastic Center of Saint Louis to vie for the Sinquefeld Cup. So I have to shout out a personal apology to Julio S., a regular member of the club who always seems to have his ear to the ground with the worldwide chess scene. He called the other day and I answered. You’d be surprised how many people call in with no purpose, just wanting to chat about chess. Julio is one of them. And I had to withhold the secret of secrets, just through the weekend. Last week, he called asking about the Sinquefield Cup, this half-mysterious press release that was kicked out two weeks ago announcing a tournament involving “some of the strongest players in the world.” It was completely void of any useful information – behind the scenes, the club was waiting for players to cross the Ts and dot the Is of their contracts – and personally I think it was a dirty media trick to kindle hype. Julio fell right into that sticky trap. His conversation was casual enough … not exactly prying, but certainly with agenda … and I’ve performed enough interviews in my day to figure out where he was headed. He went through the list of the top 10 FIDE players in the world, with random remarks about how wouldn’t it be neat if this guy visited St. Louis, or how that guy would never come to the U.S. – just seeing where he could get a rise out of me. I didn’t budge. Couldn’t. Call me a terrible journalist: The truth might get you canned. “Makes sense to me,” I said, biting my tongue. Julio did well at sniffing out some proper assumptions, but it tickled me to hear that even the die-hard enthusiast couldn’t quite dream up this scenario. The Chess Club and Scholastic Center of Saint Louis just announced that it will bring in four of the world’s top-10 chess players for the strongest-ever tournament on U.S. soil. This September matchup will feature Hikaru Nakamura and Gata Kamsky -- America’s top-two players -- as well as Norway’s Magnus Carlsen and Armenia’s Levon Aronian – the world’s top-two. The story lines are as big as they come. Carlsen is 22 and the world’s highest-rated player ever, currently at 2864. He was 19 when he became the youngest-ever to hold the world No. 1 rank, and truly the only thing he has missing from his resume is the title of World Champion. Until, perhaps, this year. Last April, Carlsen won the Candidate’s Tournament, earning the prize to challenge current World Champion Viswanathan Anand to a head-to-head battle for the title in the 2013 World Chess Championship. That will happen in November. Carlsen will be here in September. Now, I’ve seen Rocky enough to know he’s going to need training time before taking on Anand. And I’m not privy to Carlsen’s tournament agenda, but it’s possible the Sinquefield Cup might be the last time we see him in action before the big fight. I cannot wait to welcome him into the finest Chess Club the nation has to offer, right here in the Central West End. And then I want him sent home packing. Blown off the board. Tail between his legs. This will be the first time Carlsen ever plays the game of kings in the U.S.; and I want Nakamura and Kamsky to rise on their home turf like no other tournament before. I want America defended, because chess is the best form of warfare. I wish Carlsen the best of luck on the world stage – I will even root for him – but when he comes to play chess in the U.S.A. for the first time ever, I want to see Nakamura dressed in Under Armour, screaming “We must protect this house!” Actually, I’ll settle to see him in his oversize American-flag tie and that big, toothy smile. Carlsen will dominate headlines, of course, but I want the storylines to watch the American duo clamoring for the Sinquefield Cup. Kamsky has been outstanding as of late, blazing up the World Rankings to now sit tenth on the globe. And perhaps the only one to outperform his recent success is Nakamura, who apparently took questioning as to who the U.S.’s true number-one was to heart. This past weekend at the Tal Memorial in Moscow, Nakamura served up three consecutive wins against super GMs Vladimir Kramnik, Sergey Karjakin and Fabiano Caruana – ranked third, fourth and seventh in the world at the time. It has been one of his finest three-game stretches in his career, putting him alone in front of the elite tournament. It has brought him back up to fifth in the world – and secured him as top dog in the U.S.
And on the heels of all that: an announcement that he’s returning to St. Louis, to fight for the homeland. These colors don’t run!